Some people whistle while they work but I’m not one of the Seven Dwarves. Others may go to Tiffany’s for Breakfast but I don’t have a branch of Tiffany’s conveniently nearby. I choose to eat while I work. And under the Promenade Planting classification system gardening is considered Work with a capital W. It’s important stuff this Work and you need to feed the brain, the tummy and the soul. It’s hungry stuff you know. Eating while you work is OK. In fact it is more than OK it is Good for you with a captial G. The rule is you have to do some work, you can’t just go and graze. What is defined as work is a bit sketchy and if I’m honest open to interpretation. My interpretation. And it will vary according to season, day, weather, mood, time. That’s the Management Rules. Picking Autumn Fruiting Raspberries while you work is good. So good. I recommend it. In fact if I was a lifestyle guru that’s what I’d advise for a healthier and happier existence. The lifestyle guru rules would be simple; eat well, live well and play nicely! Trouble is somedays you are hungrier than others and you get a bit carried away. Other days you can polish your personal halo as you did sharing. For some strange reason those days don’t seem to happen very often. My parents used to send us to pick strawberries without any breakfast. I can remember putting one in the basket and one in my mouth for quite some time until I could not look at another berry for quite some time. There is nothing like the fresh warm berries straight from the vine. What a lovely memory, and thing to do – to go picking strawberries. i suppose it was a bit like working in a sweet shop, you eventually get over the novelty ! I agree with BAM. There is nothing so enjoyable that popping a just-picked berry in your mouth. Too bad that only it whets the appetite and, with the 2nd berry, the guilty pleasure factor enters the picture, making a 3rd, 4th, 5th, et al, not only possible but nearly inevitable. When you think about it, it’s a wonder berries were around long enough to become cultivated. I think it’s nothing short of miraculous that berries have made it through the millennia to be culivated and then promptly stripped by us John !! When my husband was a boy and sent to pick the strawberries he had to keep whistling. If he stopped they knew he was getting into the strawberries! definitely little precious gems !! 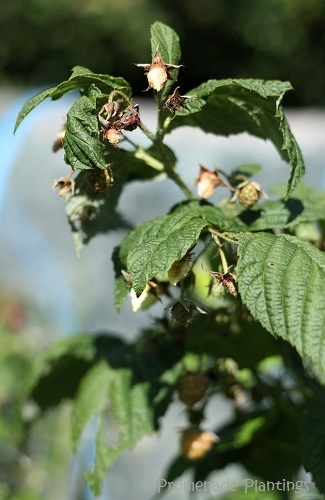 I’m trying to cultivate a pancake plant to grow next to my raspberries… it really would be perfect then! Nothing compares to fresh berries, picked yourself with a few being eaten along the way. One of my fondest memories from childhood is being at my grandparents’ house and going into the garden to see what we could find. Raspberriies, strawberries, gooseberries, blackberries and then we could head to the fruit trees for more goodies….. Bliss!! Lol 🙂 I think the supermarket tastless version is a problem the world over! I chuckled to see nothing but the twigs you left behind after the breakfast chomp!!! Hahahahaha. Wicked cute Sunday morning post, and absolutely beautiful fruit in your last photo!!! 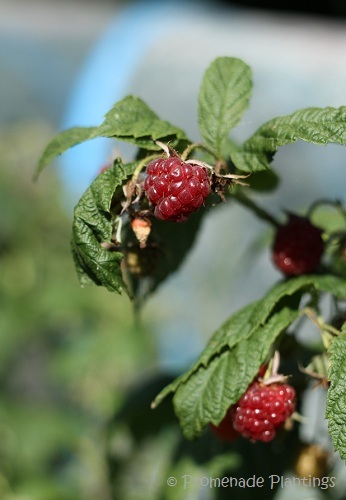 Well, you *know* how good a certain someone in this garden is(n’t) about sharing her berries…Enjoy them while they last; raspberry season is way too short! Luscious summer photos! How different our world will be in a few short months. I am savoring the ruby red berries as they are a very special treat! Sharing is optional! Our worlds will be so different in a month or two, the colours will change, the air will be cooler, the leaves will be off the trees…… I just need to hold on to these summery days a bit longer Deb!! My mother knew better than to send me out to pick raspberries for breakfast..somehow the bowl did not get filled up. But I did! Oh Smidge, the words “sad bowl of cereal” make me want to share ! Beautiful berries….no wonder you ate them right off the vine! I have been thinking about planting some berry bushes in the fall…I think your blog post just convinced me this is something I should do. Thanks. hi Teresa, I’ve been gradually planting more and more fruit bushes, I’ve come to realise just how special homegrown fruit is, it’s so fresh and such a treat. Happy gardening ! And I see Perks has a capital P, very appropriate Joanna ! I guess in a way being the gardener is a bit like being the cook — you get first dibs at everything, and who’s to know what doesn’t get shared! Ah yes, we are eating tomatoes in the garden now in suburban Maryland. Last year was raspberries, but they began to take over all our raised beds, so DH pulled them all out. Will have to start afresh next year. Luckily in this climate, raspberries are a weed! Great photos, Claire, thanks! Sorry that was meant to say, all except for the playing nicely, that stays ! I’m definitely missing my berry plants which were pulled for the placement of our chicken coop. Next year, I must replant. They are precious to be treasured days Tandy ! Hope you have a super week ! I’ve been popping grapes into my mouth as I muck about in the greenhouse. One of the vines is tied into the roof ridge, and it always offers up ripe grapes before the other vines do. Happy gardening! Love your rules Claire–oh how I wish my garden had berries!!! Is it too hot for them Stacy? and if so, I’ll have a quiet sob for you ! But I sppose the upside are things like aubergines – something I never seem to manage to grow! Ah I see !! A lot of fruit like that kind of soil, something to do with nitrogen and pine needles, a lot of gardeners say to not put the needles down as a mulch as it takes lots out of the soil but I should imagine things like blueberries would like those conditions too ! Right on! Beautiful berries and I see you’ve changed your look. Nice! Thank you, I have still yet to find the time to sit down and play with my new look ! 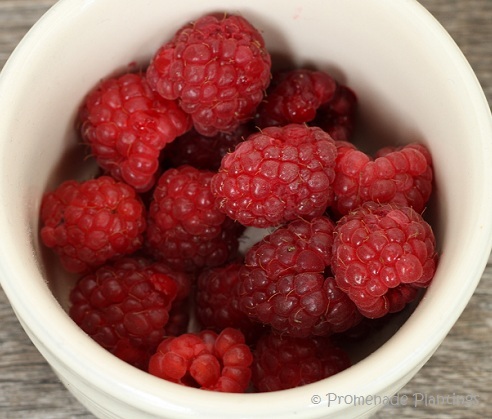 There’s something about eating raspberries, warm from the sun and straight off the bush! I had another mouthfull yesterday, I need to keep my energy up ! And yes, nothing beats them and the real bonus is that they haven’t seen a fridge or a cooler in their lives !! I’ll take eating while you work over the whistling especially when it involves lovely ripe berries. Who really needs a halo anyway? Just gets in the way of the wind rushing through your hair as you dance off on your every adventure, I should think! Eating on the allotment included. 🙂 I don’t think a halo would last long on me, besides it’s nearly always windy here by the sea ! One of the great pleasures of life is eating a sun-warmed fruit, herb or vegetable from one’s own garden. There is ‘vitality’ , yes, but also ‘gift’ and ‘cycle’ and ‘tending’.